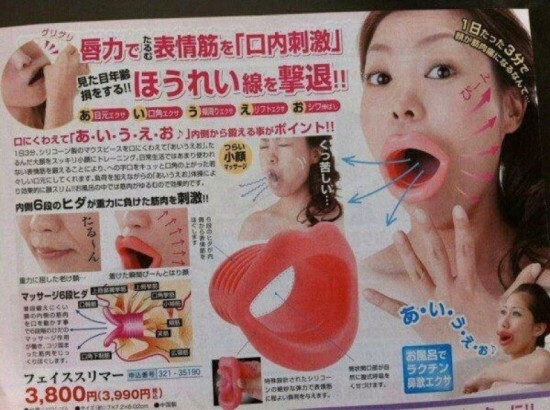 He wrote: "so apparently this "invention" is supposed to give you a bigger "smile". First of all, she doesn't seem to be smiling in the slightest. Crying would be a more appropriate description of her face. Secondly- i would argue that this "invention" is goin to be misused to come in handy for "other things." "
Okay, you didn't have to say it out loud, dawg! This MOUTH claims to fight wrinkles around your eyes and help shape the overall look of your face. Then typical me googled more Japanese beauty tools, mainly to laugh at them, and I found a few more weird, but interesting, beauty tools. Please Note: All pics & descriptions are copied from a website ~ www.japantrendshop.com. Push up that nose of yours to create the perfect profile with this handy Beauty Lift High Nose, a beauty gadget that applies gentle electric vibrations from the bottom, side and front. Just slip it on and turn on the switch on the front of the frame. While the supports hold your nose in place the buzzing will help shape your nose into just that little bit firmer and higher. All you need is three minutes once a day and you (and everyone else) will soon notice the difference! The Beauty Nose is designed to firm and tighter your nose, giving you the high profile you've always desired. Adjustable to two degrees of hardness, the clip puts gentle pressure on four nose bones in order to align your nose the way you want it. 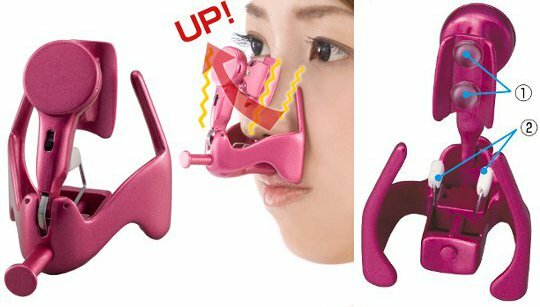 Hana Tsun Nose Straightener- "Hana" means nose in Japanese, while "tsun" means to perk or stick up, just like a nose should (physically, not metaphorically!). After slipping this clip gently into your nostrils, the supports on either side will help balance and push up the bones and contours of your nose, so it has an overall sharper, straighter shape, less round and more graceful. Great for wearing at home or in the bath, daily use will result in clear effects soon becoming visible and eventually a "smaller" face (that's what "Kogao" means). The double layer of nylon and polychloroprene will trap heat and work on those smile lines or laugh lines that we all hate. In pink and gray, the tight belt may take a little getting used to but you will soon be smiling, all while knowing you can now combat the aftereffects of laughter and fun. Do they work? They probably do. I believe exercises & massage do help alter the shape of things, and if there are tools to help make it less tedious, why not? If you want to be taller- Stretch. Believe me, had I known to do yoga in my teens, I would probably be at least 2 inches taller now. If you want a longer nose- Massage & pull the tip everyday. If you want a shorter nose- Push it in everyday. I do this. If you want an thinner face shape- Massage it to the shape you want regularly. From the tools above, I think the big lips are cray cray. 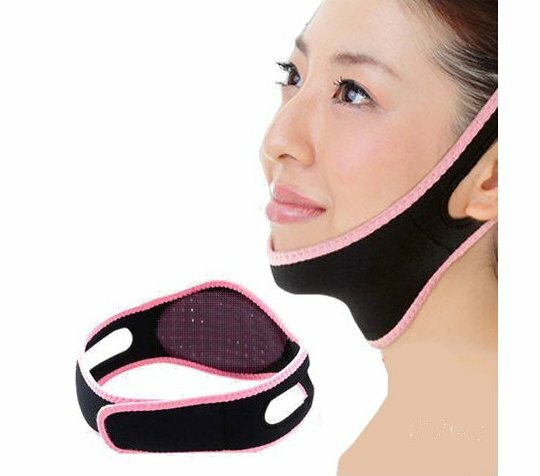 But I think the nose and face belts would work with regular use. I'm not saying they'll really work, I'm only saying they could work. I don't know. ***Please take this for what it is. I'm only sharing fun(ny) beauty-related stuff, and not encouraging people to alter their face shapes. This is crazy and scary to an extent :P haha! Oh dear Lord this is crazy funny! Ohh ok :)I heard it somewhere I guess. I hear it's addictive, but it's just not my kind of show.